Brand new for Fall 2011, REV'IT! has completely remade their rain collection with four new products. All of this gear is now REACH certified, which is a European standard that bans the use of over 30,000 harmful chemicals that can be damaging to both the environment and workforce. This means that all of the new REV'IT! Rain Gear is also PVC-free. Constructed from PWR|Nylon 190T which is coated with PU, the two jackets, one full suit, and pair of pants are completely impervious to the ill effects of mother nature dumping buckets on you. 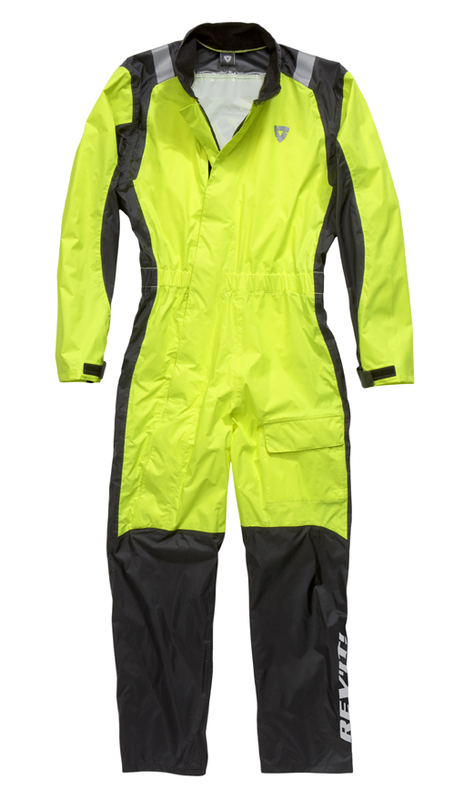 Also, each piece (save the pants) is available in a hi-viz colorway. One of the most remarkable features of the REV'IT! 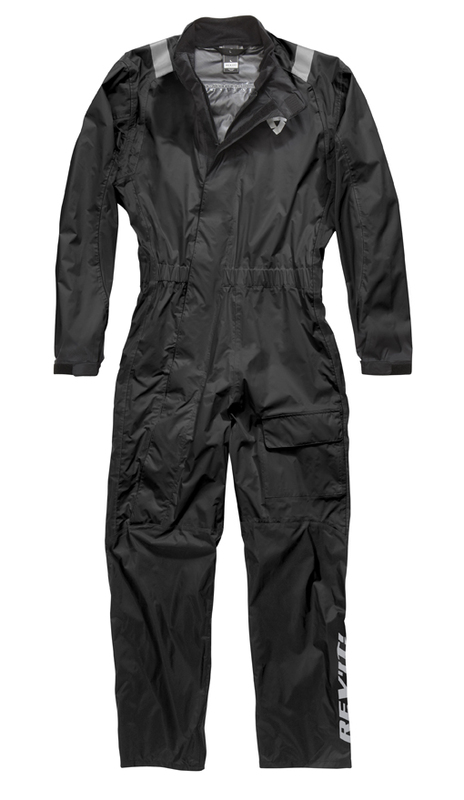 Pacific H2O Rain Suit is how lightweight it is. Easily stuffed into its included sack, the Pacific can be stowed in a side case when not in use. It also can be put on and taken off in seconds, which is crucial to staying dry when the sky opens up. The interior is coated with a nonstick treatment which assists in the speed in getting it on and off. 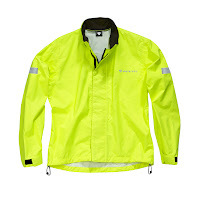 There are large 3M scotchlite panels on the shoulders and legs with reflective logos on the chest and back that ensure visibility, even if you're not wearing the hi-viz version. There is a also a stash pocket on the front leg, and adjustment velcro tabs at the cuffs and the ankles. The large main zipper is protected by a storm flap and rain gutter to keep you water-free. The REV'IT! Nitric H2O Rain Jacket offers a ton of features and functionality that separates from your basic save-the-day rain jacket. Built with the same material as the Pacific, the Nitric H2O packs a ton of features not typically seen in rain jackets. There is adjustability at the cuffs, collar, hips and waist to ensure that you can properly cinch this down and keep all wind and water out. There are 3M scotchlite reflective panels in strategic areas for visibility. Another big feature is the ample storage possibilities in the Nitric H2O with cargo pockets in the front, a waterproof internal doc pocket and a tuck-away pocket for the built-in hoody. It is also extraordinarily lightweight and quickly stuffs into the provided transport sack. Consider the REV'IT! 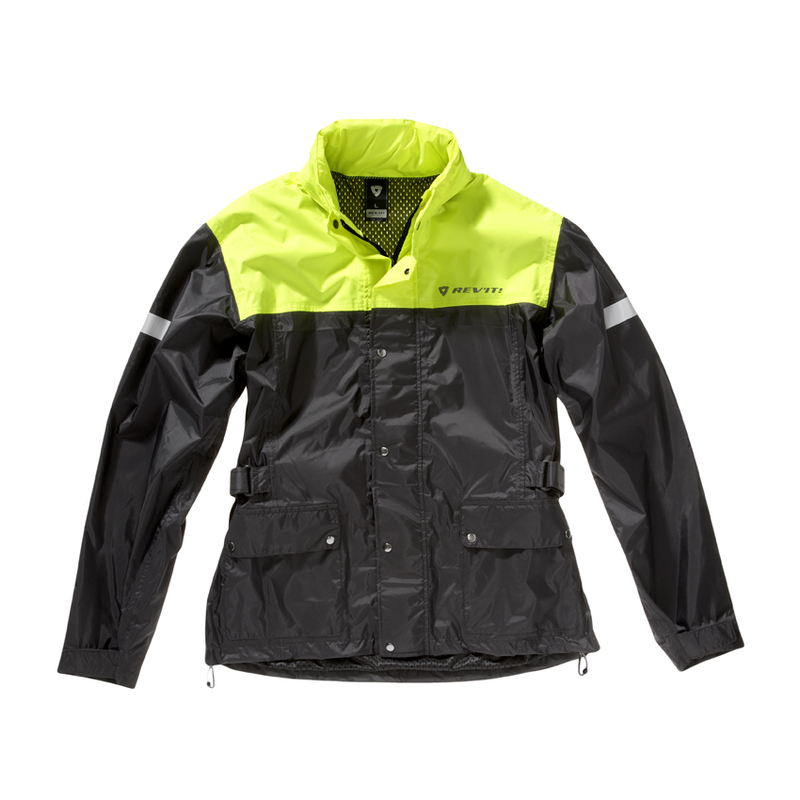 Cyclone H2O Rain Jacket the more basic little brother to the Nitric. Built with the same materials, the Cyclone doesn't have the same storage possibilities or adjustment and cinching that the Nitric has. However, it offers waterproof breathability and an incredible light weight of 260 grams, and can be quickly rolled and stuffed into the included transport bag. There is cinching along the bottom hem, and the non-stick coating on the inside allows for quick on and off to ensure that your day will be saved and you won't get soaked. Also available in a hi-viz version, this is what REV'IT! is billing as the "day saving accessory of the year" and it's hard for us to disagree. Pair either of these jackets up with the REV'IT! Acid H2O Rain Pants.